Taken any great photos lately? Great! In today’s Academy lesson, we’ll discuss how to use S-Drive to show off your pictures with amazing photo albums. If a picture is worth a thousand words, then an album is worth 1x10^17 words. They can tell a story, recall an event, showcase art or talent, and non-literally touch the hearts of those who view them. They can help form bonds between family, friends, fans, and business associates. It gives you a convenient and smooth control panel for uploading, organizing, showing and sharing your photos, within your own website, a full page, or both. Using the photo manager in the S-Drive Dashboard, you can manage your albums anywhere that you have access to a browser. But the party doesn’t stop there. You can add photos straight from your mobile phone, too! Just snap & send, using your own convenient email interface. 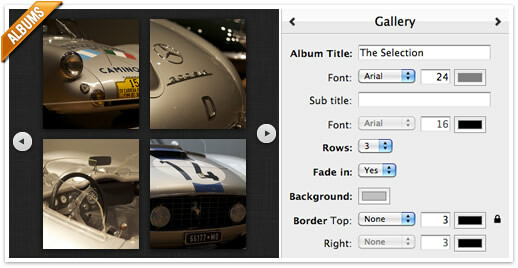 Plus, galleries can be embedded anywhere on the web that you can enter HTML. The Albums tab contains all of the photos you’ve added, showing them as comprehensive collection. Even when you add photos directly to an album, they’re added into your collection. Photos from the collection can be added to any existing album or used to create a new album. It’s kind of like making an iTunes playlist out of pictures instead of music. Now you know that, let’s create a photo album using this amazing service! Go to the S-Drive Dashboard and click the Albums tab. In the upper right corner, you’ll see the New Album button. Click it and give the album a name and caption. You can change this stuff at any time later. Then click Create Album. Here we go! Most people already have photos in their Storage. In that case, you can immediately add them to this new album by going to the Storage tab, clicking the little gear and choosing Add to Album. Otherwise (or if you want to upload fresh images), click Upload Photos Now. Photos can be added individually or uploaded in batches using the fancy Multi-File Upload. Now click the gear in the corner of one of your photos. You’ll find a bunch of tools you can use to manage this photo, including the Use for Cover Photo option. Select this option for the image you think would look best on the cover of your album. That’s all it takes! You can click the Click to Edit button to configure your album further, including its size and whether it’ll play a slideshow and explode your visitors heads with awesomeness. Want to rearrange the order of your photos? Click the Sort button and drag them into the order you like, or choose from the Quick Sort options for other arrangement types. The magic of Albums is that you’ve got extreme control over the design in an easy to use interface. Present your picture next or on top of each other for real 'wow' effects. Give them a square or landscape look, the choice is yours. Add some rows, change sizes, edit borders, backgrounds, and tweak just about anything else. Select the Album you wish to edit from the Albums overview page (yep, you can have more then one). Then click the all-important Click to Edit button. In the upper left corner, click Theme and choose one that you like. One of the most awesome things about the new interface is being able to set the exact the number of rows and columns—your story is told in one single scrollable view! And that’s not all. Click through the menus on the top-right and check out the oodles of customization tools you can use. Go wild, and when you’re done, click Save. Now that it’s ready for people to see, let’s share your album. Click the blue Share button in the upper-right corner and select View Album to see it on the web. You can share this URL anywhere you like. Or, if you’ve set up Twitter and/or Facebook integration, select one of these options to post your album immediately to one of these social networks. Wanna see an example? Then check out our blog. We added an Album with pictures of our 2012 Halloween Party (introducing "Bones"). In short, now you can control your own content, and showcase it anywhere. Yeah! See something that would be perfect in an existing album? If your phone has a camera and an Internet connection, you’re in luck. You just need to send the photo as an attachment to the correct email address… now how cool is that!? First we need to give you a bit more information about your S-Drive addresses. You may, for example, have more than one. And one of them is set up as your primary or “default” account. Also, every S-Drive address has what is called a “slug,” which is the first word in the address. For example, in you.coffeecup.com, the slug is “you”. Each album you make has a slug, too. It’s the URL-friendly name that the album title you provide is converted into. For example, if you name an album “The Brisket” it gets converted into “the-brisket”. In http://you.coffeecup.com/albums/my-photos/, the album slug is “my-photos”. Photos added to an album are instantly visible to anyone who views it. However, you’ll get a confirmation email with a direct link to your photo so you can immediately share it on the web.